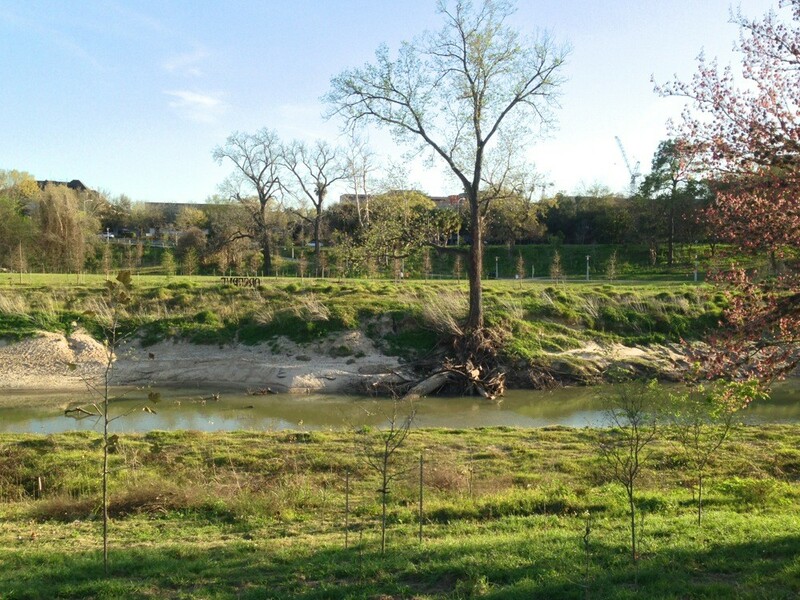 Buffalo Bayou near its source in Katy, Texas, a town formerly known as Cane Island. Image from drone video by Connor Winn, April 2016. “Visualizing Nature, The Art and The Science” was the title of a class at Rice University taught this spring by photographer Geoff Winningham, professor of photography in the Art Department and holder of the Lynette S. Autrey Chair in the Humanities, and by Adrian Lenardic, professor of geophysics and planetary science in the Department of Earth Science. 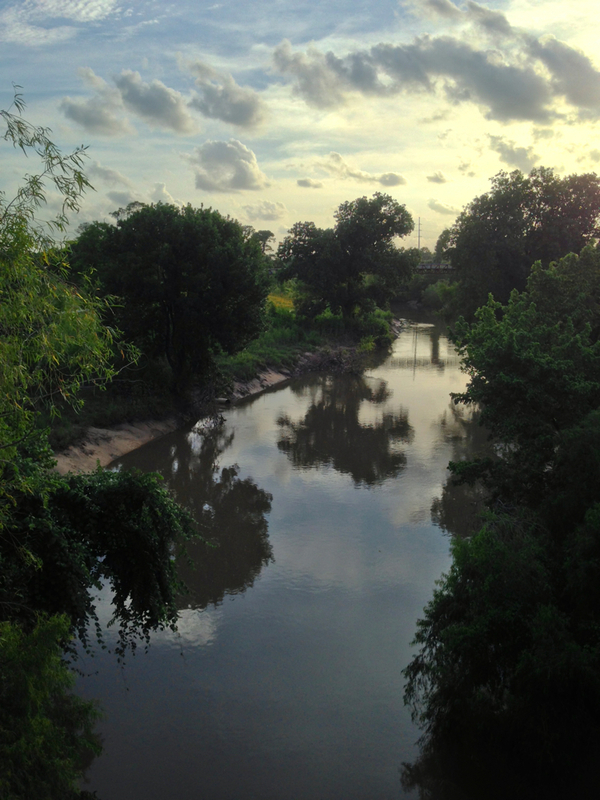 One theme of the class was the visual and scientific aspects of Buffalo Bayou. 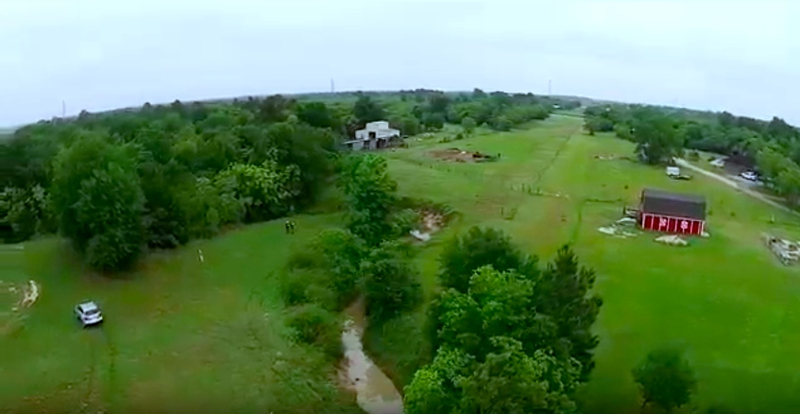 Connor Winn was a student in that class, and he made a lovely fourteen-minute video using a flying drone that follows our Mother Bayou from its quiet beginnings west of Houston. 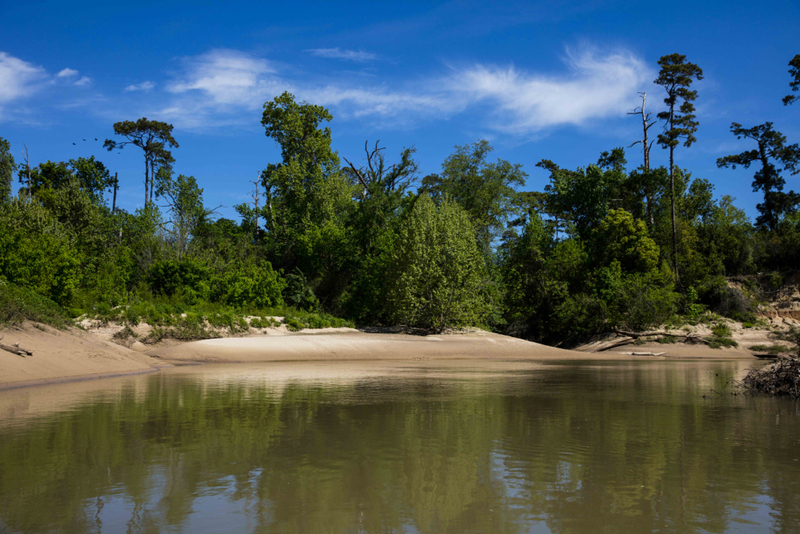 The film allows us to watch the bayou evolve from its source near Cane Island Branch, a creek, one of many feeding into the bayou, that runs through the town of Katy, which in the 1800s was known as Cane Island, named after the creek filled with cane. 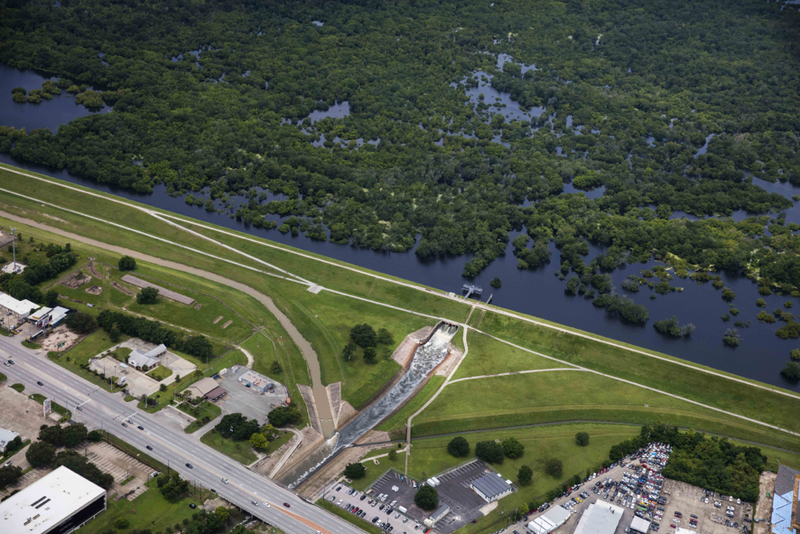 We see the bayou growing into the mighty ship channel and joining the San Jacinto River at Burnet Bay, part of Galveston Bay, near the San Jacinto Monument just upstream of Baytown. 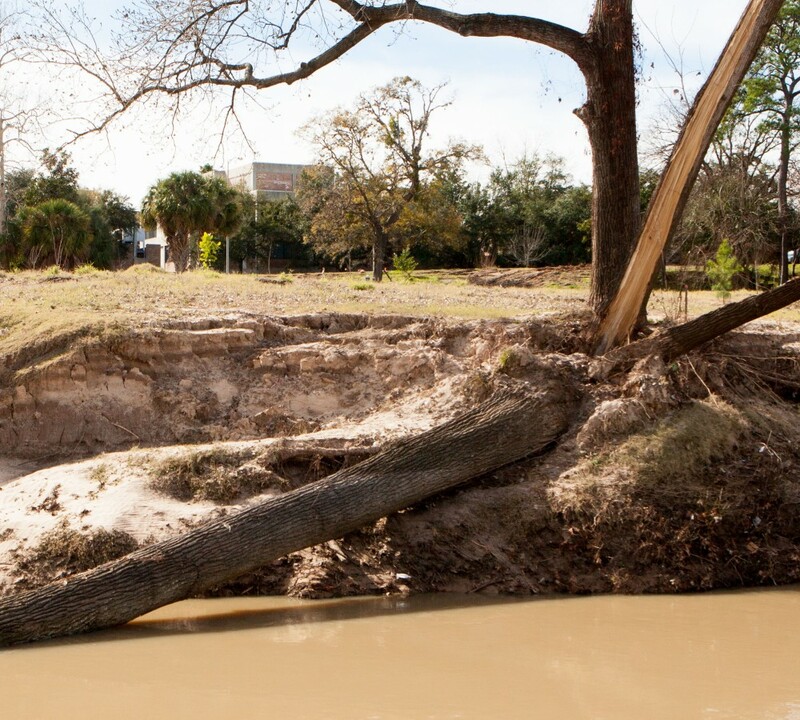 Watch Connor Winn’s video of Buffalo Bayou. Flooding on Buffalo Bayou, April 18, 2016. Photo by Jim Olive. Okay, it was a trick question. We asked our readers to identify the location of Geoff Winningham’s lovely black-and-white photo of Buffalo Bayou taken in 1998. And we asked for a photo of the same view now. Shoulda been easy. 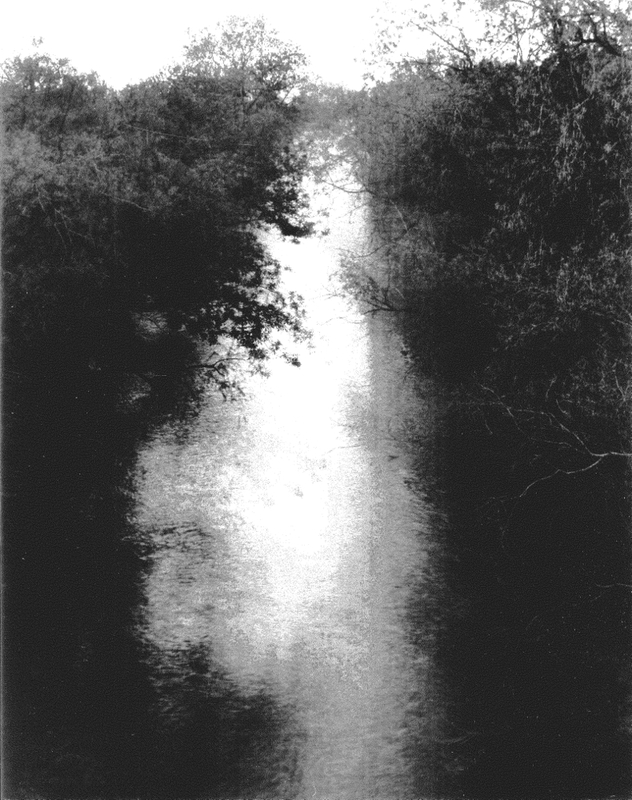 The photo was published in Winningham’s beautiful photographic study of the bayou, Along Forgotten River, which traces our Mother Bayou from its source in the Katy Prairie to its end in Galveston Bay. And the photo was identified, of course. Except that somehow the identification in the book was wrong, says Winningham. He went out and checked himself last week. The photo was taken looking upstream from the Waugh Bridge, not the Montrose Bridge. Still, the view doesn’t look much the same. 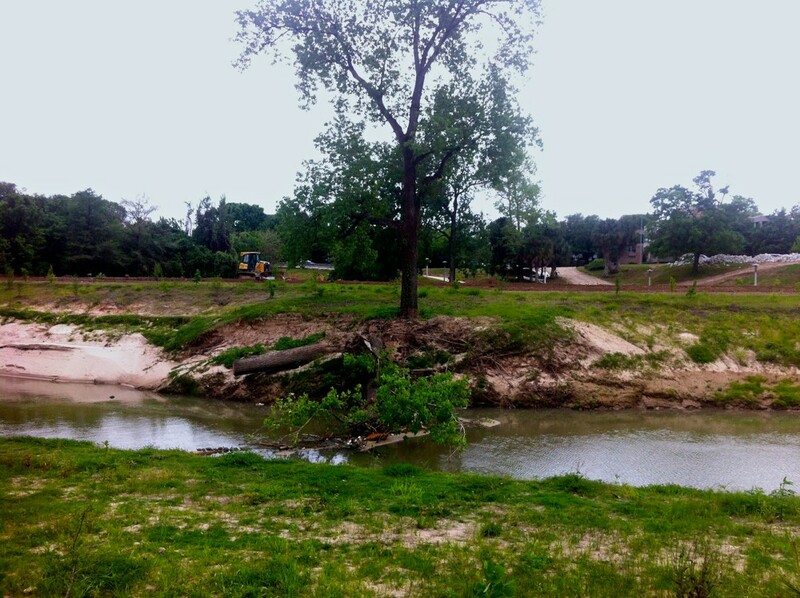 The river seems to bend differently now, after the “channel conveyance improvements” by the Harris County Flood Control District starting in 2010. Not so many trees either. Here’s the way it looks now. Still lovely. And here is the way it looked in 1998. Buffalo Bayou from the Waugh Bridge. Photo by Geoff Winningham, 1998. 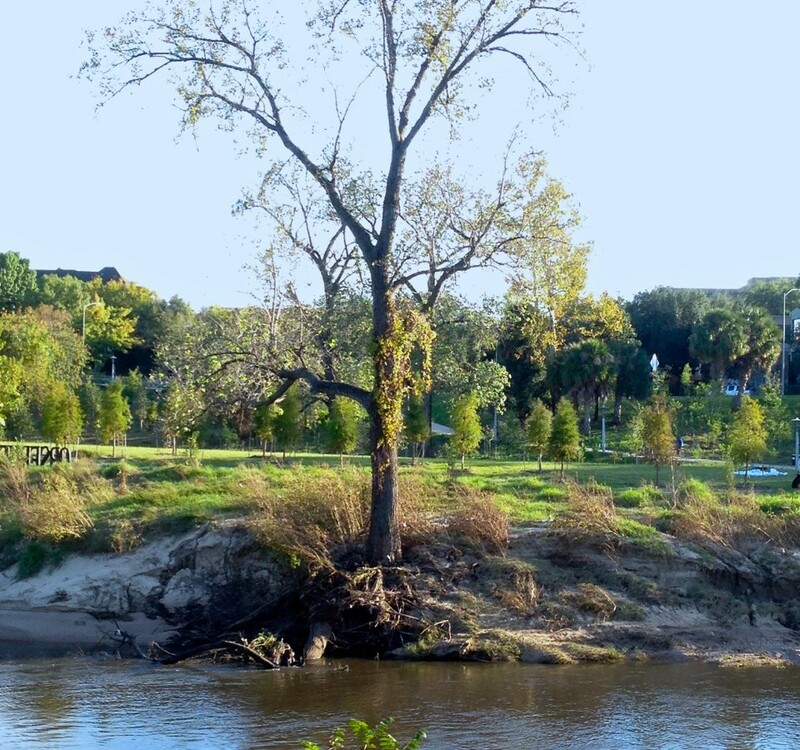 Anonymous photographer wins a Save Buffalo Bayou bumper sticker, which everyone should have. 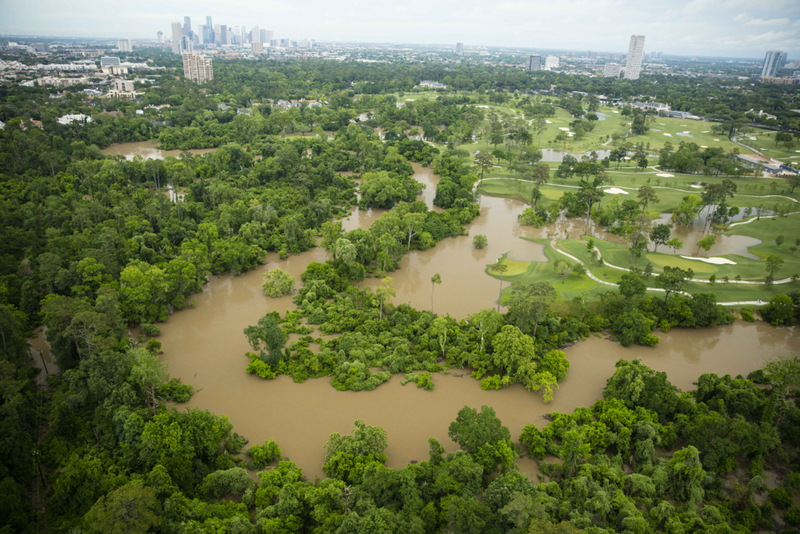 Get yours by donating to Save Buffalo Bayou, and help us promote responsible flood control that works with nature rather than against it. Wet weather and high waters in Buffalo Bayou and other streams have brought more snakes into Houston area yards. Serpents slither but really they’ve been getting a bum rap since that report about an alleged role in losing paradise. 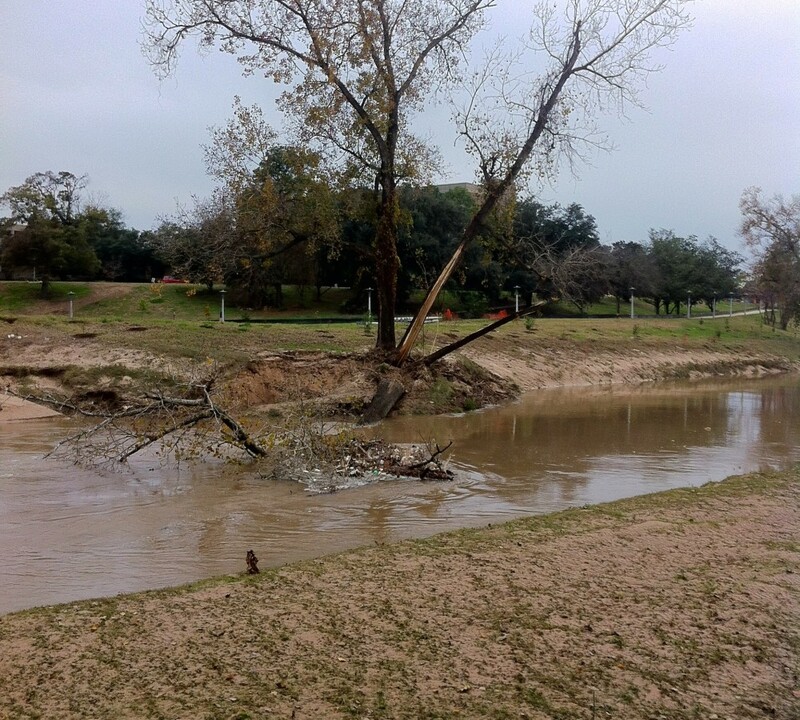 A reader recently sent in a photo of a couple of snakes in his neighborhood on Buffalo Bayou. His dog had cornered a snake in his yard, he said. The snake coiled, tensed and opened his mouth. Thinking to protect his dog, the man speared the snake with a heavy bar. A few minutes earlier, a neighbor had also encountered and killed a snake on his property. 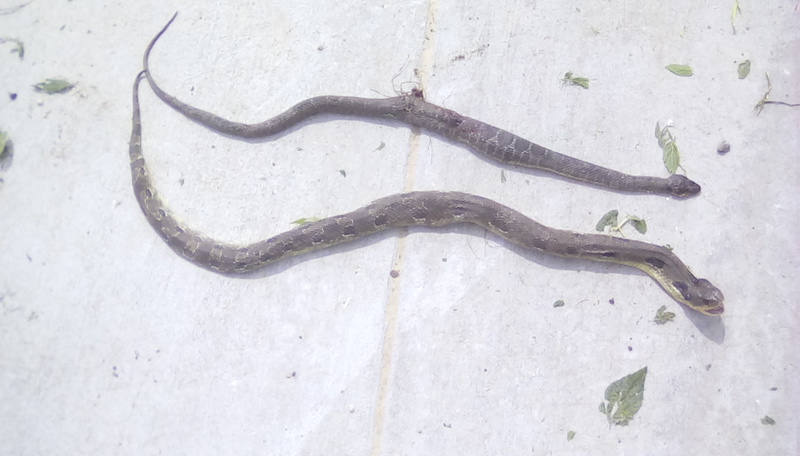 Hence, the photo of two dead snakes. 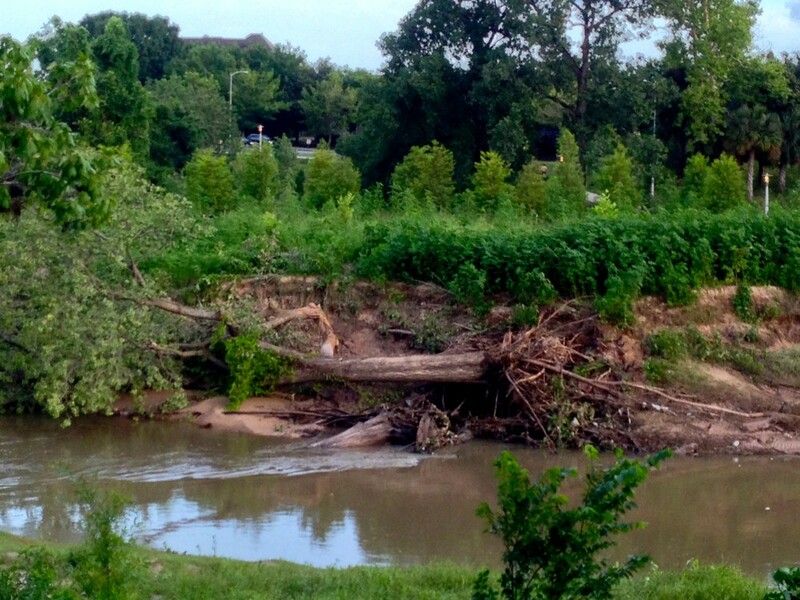 Two snakes recently killed in a residential neighborhood on Buffalo Bayou were not venomous. It turns out, however, that neither of these snakes was venomous. More about water snakes here. More about Eastern Hognose here.